The story of the MacNeill's of Canna begins not on Canna but in Kintyre where Hector MacNeill is first noticed as a merchant in Killarow, in 1762 and from 1765 to 1775 in Campbelltown. Documentary evidence confirms that in 1785 the Commissary General of Stores in Scotland writes to the Sheriff Clerk in Inverness at the instance of the Duke of Argyll to start process for recovery of 3 years rent of a field to 1781 against Hector MacNeill, late merchant of Campbelltown, Dalintober now in Canna. Two deeds confirmed the date of Hector’s move to Canna as 1781. “On the 18th of June, 1781, the tutors of John MacDonald of Clanranald required an Alexander MacDonald to resign the right of the change house (i.e. post house or inn) of Canna and two penny land in Corgoun in favour of Hector MacNeill senior. Merchant in Campbelltown, while continuing in occupation of certain lands on Sanday, signed at Kilbride, South Uist. A report of the British Fisheries Society in 1788 describes a visit to Hector MacNeill and his family. A year later 1789, MacNeill declared to the Fisheries Society that he would not take less than £400 for his lease unless he was appointed agent at the settlement for which he was not considered suitable. Clanranald for his part at first refused the additional land required by the Fisheries Society, held to be essential for the population were it to be made self sufficient then decided to offer it at an enormous price to the Society that they decided the game was not worth the candle. “So farewell bonny Cannay the best fishery station in the Hebridies and the most tempting spot for settlement-farewell poor inhabitants”. It was not long after this farewell that the township of Lag a’ Bhaile was cleared to Sanday for kelp harvesting between 1788 and 1805. It’s interesting that the Clan Donald genealogy archive names Donald MacNeill formerly of Kinachreggan now Canna as the husband of a Margaret MacDonald a sister of Colin MacDonald of Boisdale. As pointed out by Dr John Lorne Campbell this must be a mistake with the generations being mistakenly or purposely reversed. When the Fisheries Society met Hector and family in 1788 they refer to him having his wife as a sister of Boisdale, this can only be Colin’s sister Janet whom the same Clan Donald archive refers to as dying in 1818 in Edinburgh unmarried. Another error in the recording. The reference to his brother in law having served in the American War can only be Alexander MacDonald who was also a brother of Colin of Boisdale and captain of the 71st. Regiment. He had retired with the rank of colonel and had not long married Marion MacLean of Coll when this visit took place. Duncan Macarthur was ground officer, and Macneill factor, of Canna. It was reputed a fertile island and, now practically uninhabited, contained in 1772 a population of not less than 220 souls, who had neither church nor school, only a catechist. It will be recollected that while at Canna, Alastair Mac Mhaighstir Alasdair composed most of his poetry, for the amusement, it is said, of the factor for the time. The valuations on the Clanranald estates were all penny lands, sub-divided into halfpenny and farthing lands. To stock a penny land, according to Pennant's information, required a sum of ;£30 sterling, and it carried seven cows and two horses. 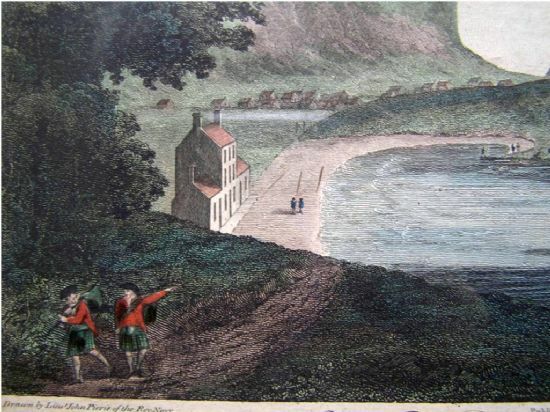 In 1745 the principal tenant of Canna was John Macdonald, who had the fifteen pennies of Tarbert and three pennies of Garistill, being no doubt the identical subject included in 1798 under the head of the eighteen penny lands of Tarbert with Hector MacNeill. John Macdonald's rent was 360 merks or about £20, so that rents even in Canna were rising rapidly in the last half of the eighteenth century. This John Macdonald was in circumstances to lend in April 1745, no less than 4000 merks Scots to young Clanranald. Of the other children, with the exception of Donald and his sister Elizabeth spoken for by a George Heslop of North Shields in 1790 and Margaret no other trace has been uncovered. Margaret was to run away with a Norwegian Captain Langfeldt whose ship had called into Canna for repairs. Captain Langfeldt took her with him back to Norway and it was sometime (1849) before she received any inheritance from this will. A connection to Canna with the Langfeldt family of Norway exists to this day furthered during the lifetime of Dr. Campbell. One of his other daughters may have married a Captain Archibald MacNeill but nothing is known of the other children. Hector MacNeill is said to be buried in Canna about sixty yards to the South of the broken cross in the old churchyard. Nearby is, or should be a slab said to be Clanranald. The following comes from a recording made by a T.C.Lethbridge (a writer and yachtsman) of a conversation with Allan MacIsaac in 1955. (note this was left with Dr, JL Campbell). This letter is interesting as it shows that Donald MacNeill as well as styling himself of Kenichreggan a Boisdale estate on the mainland he was also factor on Canna and looking at increasing his land interests in Barra. Donald MacNeill was following in the footsteps of his uncle Colin MacDonald of Boisdale by grasping the improver mantle and whose fashionable term of the time was emigration. Colin MacDonald cleared many from his estates and Donald was to follow suit on Canna. Its known that a “Report of the Glasgow Committee for the relief of destitute Highlanders” in 1837 contained a full account of how Canna was managed by Donald MacNeill this unfortunately has long since disappeared. A report made to the Government in 1837 was also impressed with MacNeill’s management of Canna and its cure for the impoverishment of the Highlands, namely, emigration for those for whom there was no work and improved conditions for those allowed to remain, preferably under new large tenants with farming skills and capital from elsewhere (ie. strangers). This in fact was one of the recommendations of Duncan Shaw the overseer of the Clanranald Estates just before their sale in 1827. Another witness was the secretary of the Glasgow Committee, C.R. Baird. “The want of education was the greatest curse of the Highlands and said that Canna in particular suffered from this curse. But in general he was highly complementary to Mr MacNeill. Canna is particularly well off he said. It was purchased some years ago by Mr MacNeill, who was formerly a merchant or trader....The island is perhaps one of the finest in the Western Isles. After referring to his report on how MacNeill had managed Canna, Baird continued. The proprietor has told me that many of these islands could be made into flourishing gardens, but his plan was first to remove the people. A member of the Committee recalled that MacNeill had been a tenant of Canna for many years and as such was regarded as a protector of the people. To a considerable extent replied Baird. But the great improvements came after that. But was he not a stranger? No, but he made his money chiefly as a kind of merchant or trader. In his reply Baird was not only asserting the unfashionable view that a local man could be a good landlord (given the necessary capital of course) but discreetly alluding to some of Donald’s sources of income. A James Wilson who visited Canna in 1842 wrote, “the proprietor is doing well for himself in farming (in particular dairy farming) and other things. Adding that Canna lies a long way from the Customs House. To put it plainly, Donald was a smuggler like his father Hector before him. Whether Donald was a good landlord or an efficient one remains debateable but what is for sure he emigrated 200 people from Canna who could have mainly gone from Sanday following the demise of the kelp industry. 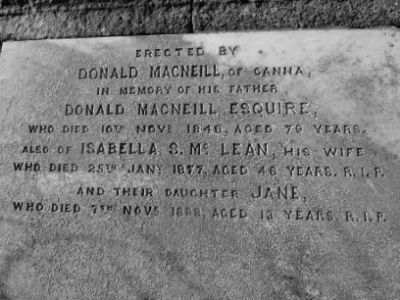 Donald MacNeill died on the 11th November 1848 aged 79 years. This places his birth before his father Hector came to Canna. This date we know from the memorial tablet raised in his memory at A’Chill by his son also Donald. No mention is made of this son Donald’s mother. We know from the Scottish Records office that by his will made in 1837 “Donald MacNeill of Canna, bequeathed, the said lands and islands to his natural or illegitimate son Donald MacNeill residing in Canna whose title is recorded in the General Register of Sasines in Edinburgh on 5th of June 1849 (book 2454 folio 267). Also in his will Donald MacNeill instructed his trustees inter alia to pay £3,000 to his natural or illegitimate daughter Jean MacNeill now the spouse of a George Mellvile of Beachill Cottage, Campbelltown. As the son Donald was born in 1833, his mother is very unlikely to have been the Jane MacDonald who gave MacNeill a daughter in 1812. In fact Canna tradition holds that Donald MacNeill jnr’s. mother was a MacIsaac, who was to subsequently marry and settle in Eigg. It is significant that the great clearance that took place in 1849 spared both MacDonald and MacIsaac families who were re-settled on Sanday. In his will Donald MacNeill senior left Canna to his son Donald along with £1,000 sterling and £3,000 to his daughter Jean. Five curators were also appointed in Donald jnr’s minority and none of these acted on the estate but with one exception. This exception was a nephew of Donald seniors, Hector Archibald MacNeill (named as a Captain of the Edinburgh militia) who was one of the original curators. He was advised however that there was no legal authority to appoint curators for illegitimate children. He therefore applied to the Court for appointment. The Court however demurred to appointing him sole trustee in case of the possibility of him inheriting and it therefore appointed him and a person of his choice as well. This person was a Captain (later Major) Archibald MacNeill and according to the Society of the Writers of the Signet these persons were son and father. It was these two who instructed and carried out the evictions of 1849. An Angus MacLeod, who came to Canna to work in the 1870’s gives a very graphic account of life under Donald MacNeill jnr. MacLeod describes Donald jnr. as a cantankerous man, always short of money and even the necessities of life. He attributed this to Donald jnr’s premarital indiscretions. Before marrying the daughter, (Isabella) of John MacLean the big Moidart drover who was to be the beneficiary of the 1849 evictions, Donald jnr. had to face two actions of breach of promise documented in highly entertaining accounts of the West record office Edinburgh. One of these ladies whom according to MacLeod, Donald jnr. had second thoughts having seen her in daylight was awarded payment in damages for the rest of her life. The Courts however do not bear this out but state that Donald had made terms with both ladies and had to put a bond up of £1,000 in return for a recall of arrestments on the estate. It is clear that these breaches of promise undermined his finances which were weakened even further by the building of a fine house on Canna for his Isabella, and the payment for an english education for their four sons who were sent to Ushaw College, Durham. Possibly to prepare them for when the crash came. There is now extant a formidable list of encumbrances on the estate discharged or otherwise when Canna was eventually sold to Robert Thom in 1881 which amply justifies the tradition that Donald MacNeill junior was ruined by debt. One of the old women evicted in 1849 had exclaimed “You will leave as poor as we” These words were recalled in 1981 by the Canna postmistress, Mrs Mary Ann MacLean, in her picturesque language. “gun chearc a bhith agad a sgriobas do shitag” roughly translated “there will not be a cockerel or a hen to scratch about your dunghill”. The memorial tablet raised by Donald jnr. to his father in the old churchyard of A’Chill also commemorates his wife Isabella MacLean, and their daughter Jean, who died at the age of 12 in a convent in Inverness. The couple also had four sons, Donald, John, Henry and Peter. These all moved with their father to Tobermory when the island was sold to Robert Thom in 1881. MacLeod goes on “He was not missed much”. The sons were to settle in Manitoba, Canada. It’s said that the father never made it and according to Dr. Neil Morrison in Tobermory “he is buried in this parish”. No record of a death certificate can be found in Manitoba. Nothing much is known about the origins of these MacNeill's. Hector was probably an eldest son as in 1800 he and his brother Alexander agreed to accept an award of an arbitrator to settle claims arising out of Hector’s administration of the will of their mother Elizabeth. This will also shows that there were two other brothers Stephen and Malcolm. Unfortunately no trace of Elizabeth’s will or her marriage to Hector’s father remains. Angus MacDonald speaking in 1946 said that Hector MacNeill came from a farm near the point of the Mull of Kintyre. His daughter in 1981 gave the name of this place as Poll a’ chreagain or pool of the little stones. This place cannot be found on existing maps, although places called Ballygroggan and Ballychreggan exist (near Lossit) though not near the point of the Mull. She also said that Hector was known as Eachann Dubh. Angus further claimed that this first of these MacNeill's was Ian Ileach (John of Islay). In Neil Cameron’s, MacNeill's of Ardnacross and Islay, he demonstrates that many of the MacNeill's of Kintyre and Gigha also appeared to be owners or tenants of land in Islay. Hector could have been one of these. Some further research on the birthplace of Hector MacNeill revealed an interesting point as made by Dr Campbell. In the Gaelic place names of Kintyre the name for Ballygroggan is Bail a’ chrògain. (Place names of Argyll, Hugh Cameron Gillies MD 1906). Both names Ballygroggan and Ballygreggan, Bail a’ chreagain (village of the little stones) are modern day farms close to each other near Machrahanish, South Kintyre. Mary Ann MacLean (daughter of the Canna tradition bearer Angus MacDonald) was almost correct in 1981 when she mentions Pol a’ chreagan as Hector’s place of birth. Could she have mistaken Pol for Bail in the passing down. A search of the “Leases of the Duke of Argyll, 1709/10 Kintyre revealed the following extracts. Could the Donald MacNeill of this entry have been Hector’s father. It’s interesting how family Christian names repeat with both Donald and Archibald passed down in the family. In the Canna Collection, Dr. Campbell has a copy of the will of Elizabeth MacNeill widow of a Donald MacNeill of Bealachnahully (bealach na h-ulaidh, pass of the treasure? possibly near Lossit), Kilkivan Parish in Campbelltown, written in 1775. In the will she names her sons as being, Colin MacNeill merchant in Campbelltown, Hector MacNeill senior merchant there. Malcolm and Stephen MacNeill both deceased, late shipmasters in London and her youngest son Archibald MacNeill shipmaster in Campbelltown. Another interesting aspect is that Donald MacNeill is also named as being in Killarow in another lease extract. Killarow (cell of Mhaelrubha) being the farm in the parish of Killean and not Killarow parish in Islay as mistakenly assumed by genealogist Sir Archibald Ross. Another interesting aspect of this is that an Archibald MacNeill is also named as a farmer of Killarow, Kintyre in the 1694 Hearth Tax Report and Donald is mentioned again in the account of the MacGillchrist family of Killean, Kintyre. So how did a merchant farmers son from Kintyre end up marrying a daughter of MacDonald of Boisdale and into one of the prominent Jacobite families of the time? The clues are possibly in the Clan Donald genealogy. Many merchants of this era were also heavily involved in smuggling. Could it have been that like his daughter Margaret, Hector sailed into Loch Boisdale and carried away Boisdale’s daughter Janet. Having many trading contacts on the western seaboard, Hector MacNeill may have been useful to both Boisdale and Clanranald hence the grant of tack in Canna. Being not from any landed family in Kintyre (as pointed out by Dr Campbell) Clan Donald decides to write him out of the genealogical line and replaces him with his son at a later date describing his wife Janet as dying childless. the old Dr is dead fair Hector McNeill lives in Dalintober worth £15,000. Here lie the remains of Hector McNeill late Master of the Sloop Lady Mount Stuart of Rothesay who departed this life on the 28th day of April 1802 Aged 46 years. In 1802/03 Hector MacNeill snr. Names his eldest son Donald as his successor no mention of Hector, could this have been why? The sloop Lady Mount Stewart was built by Ralston and Smith shipbuilders of Ayr between 1709 and 1806. Interestingly the ships of her class were coastal traders who visited ports of the West Coast of Scotland, England, and Ireland. She also visited ports in the Baltic and Canada. The perfect type of vessel used for smuggling or kelp transport. She was to sink of the coast of Campbelltown in 1818 on route from Ayr to Bangor. Another very interesting aspect of this link is that Ralston and Smith, shipbuilders built the ship, Victory, used by Donald MacNeill snr in 1819 to emigrate many of the 200 residents of Sanday to Pictou, Canada. It’s also known that on Donald MacNeill seniors death he left his son an eighth share in a ship call the Hebridies (a known emigrant ship. See ship list Hebridies, 1850 Durban) and a smack called the Margaret of Greenock. How and when did Donald MacNeill get his tack of Kinachreggan? We are currently researching this link with the Scottish National Archives and the rentals of this Inverailort estate from its forfeit in 1745 to its sale to General Alexander Cameron in 1828. Donald MacNeill was a very adventurous man who grasped the fashion of the time following the failure of the last Jacobite rising, Emigration or great improver. Donald’s claim of fame though was his ability to own outright the Islands of Canna and Sanday following the disastrous downfall of Clanranald himself. Donald’s line was preserved not through any high born marriage but through local girls of families who were to be spared emigration. In his will he was to leave £1,000 each to one of his curators, his nephew Hector Archibald MacNeill residing in Edinburgh and his own natural son Archibald. Hark back to the names of the rental of Balligroggan and Killarow! 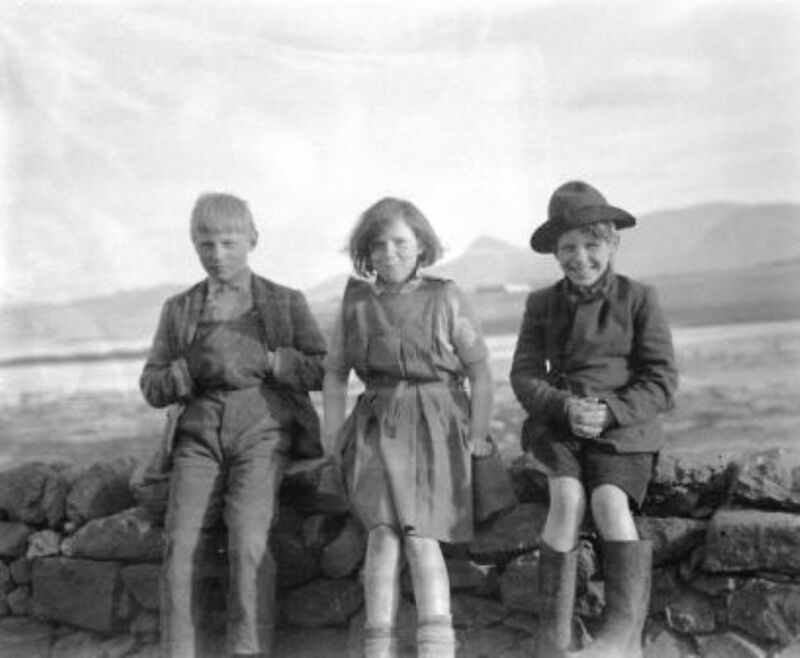 An interesting account of a meeting with Donald on a visit to John MacLean at Kildonnan in Eigg with two of his children Jean aged 4 and Donald aged 2 describes them both as speaking only Gaelic. His surviving children, John, Henry and Peter immigrated from Tobermory to Manitoba where Dr. JL Campbell had some correspondence with Henry a distinguished lawyer. Donald was to die in Brisbane, Australia in 1945. There will be descendants of these McNeill’s in both Canada and Australia to this day and we hope that you will find this internet link one day and realise your connection to the McNeill’s of Canna. The old graveyard at A'Chill. The MacNeill Mausoleum is on the top right corner. The Clanranald stone is centre left lying flat. It's said this stone was dicovered here whilst digging a grave. 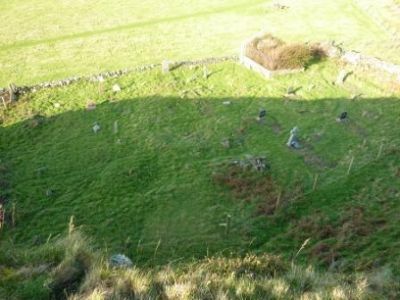 The remains of a rectangular chapel can be made out in the centre of the photo. Hector MacNeill's remains may lie here under a piece of Portland stone.